Friendship is one of the primary reasons our members join and stay in Rotary. To help foster these life-long relationships, Rotary Fellowships offer Rotarians, their spouses, and Rotaractors opportunities to connect with one another while enjoying favorite recreational or professional activities. 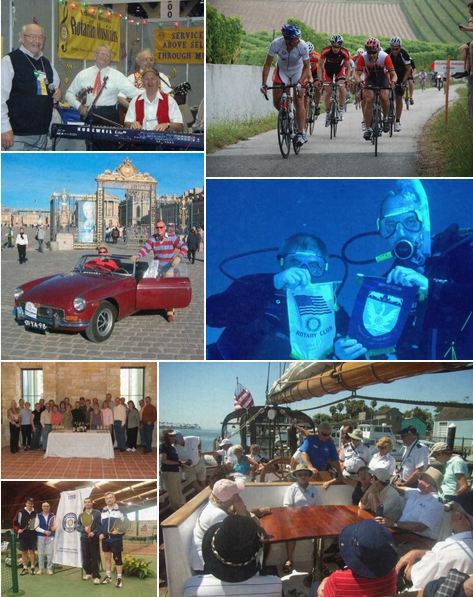 There are currently 64 Rotary Fellowships covering 64 unique topics of interests from tennis to wine appreciation, marathon running to cooking, scuba diving to recreational vehicles, jazz to computers, and more. Rotary Fellowships organize regional and international events, contests, and meetings where their members bond and build lasting friendships outside their clubs, districts, and even countries. Every year, nearly half of these groups attend the RI convention, exhibit in the House of Friendship, and organize events to practice their favorite activities and strengthen relationships with fellow members. Whether providing a refrigerated food truck to a food bank in Faro, Portugal, or partnering with Rotary clubs on a humanitarian service project to help a marginalized community with albinism in Ukerewe, Tanzania, many Rotary Fellowships also use their hobby or vocation for service activities. Several Fellowships have been leveraging their major events such as annual sporting championships or dinners as a platform to raise funds for Rotary’s PolioPlus program. Check back here throughout the month of June to help us celebrate Rotary Fellowships Month through inspirational services stories from various Rotary Fellowships. We hope these stories inspire you to join or start a Rotary Fellowship. Contact each fellowship directly to join. Read about the many service activities these groups organize every year. If you’re attending the 2015 RI Convention in São Paulo, visit the House of Friendship Friday through Tuesday, 5-9 June. More information can be found online: http://www.riconvention.org.